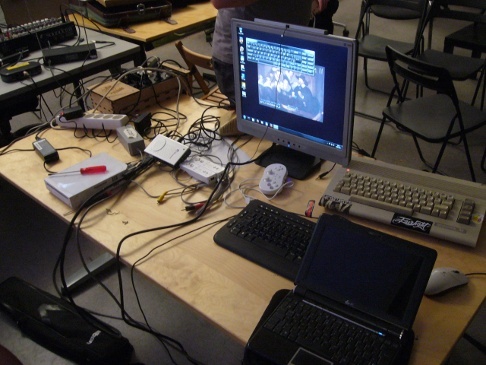 On June 18th, 2011, Demoscene Outreach Event II took place in the Metalab in Vienna, Austria. The Metalab is a "hackerspace" close to the city hall which is owned by a private club and sometimes hosts demoscene related events, such as the Realtime Generation party in 2008. Like the first Demoscene Outreach Event, Demoscene Outreach Event II was organized by Paralax of Speckdrumm. He invited several sceners from Germany to deliver presentations about various aspects of demo making. 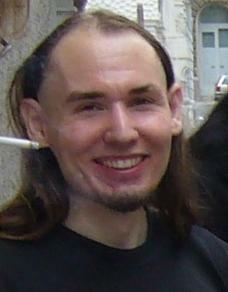 The original plan was to make more "outsiders" get interested in the demoscene. Alas, among the 30+ visitors there were mostly active demosceners, ex-demosceners and other people who were already involved in the scene in some way. The event was supposed to start at 1:00 pm with a speech by DeeKay of Crest on the state of the art in C64 graphics, but there were some problems setting up the beamer to display the C64 screen, which delayed everything by almost an hour. Eventually DeeKay delivered his speech and everybody was happy. He talked about a graphics mode that had been invented by a fellow member of his group and required an extension named REU to work, for which no demo had been engineered before. After a short break Ragnarok demonstrated how to use the program wings 3D to create low-poly models. The audience could watch him creating a space ship somewhat looking like a particular part of a male body. Then Widdy delivered a presentation on Wii programming in which he mostly talked about technical data of this console and in the end showed two of his own works, one involving just the aforementioned part of the male body. Next was Abductee with a short speech on ideas how better demos could be made, and then las talked about sphere tracing, also called raymarching, a technique that is very popular among 4k intro coders these days. The next speaker was kb, who introduced the concept of Werkkzeug 4, a more flexible development tool that not only worked with a demo engine but could be used for many things, such as converting game-related data for various platforms. The most interesting part of the event was JCO's workshop on music composition, which came next. JCO showed live how to compose a goth anthem using Cubase. It was very fun. In the end the evening was concluded by a show of various examples of demoscene music. Among the visitors there were various (ex-)members of Surprise!Productions, such as The Faker, Peci, Haddoc and TMB, as well as Franky of Farbrausch, who had not visited almost any demoscene related event for ten years, T$ of Alcatraz, Kojote and Blockbuster of Speckdrumm, eyesee and a couple of female sceners.